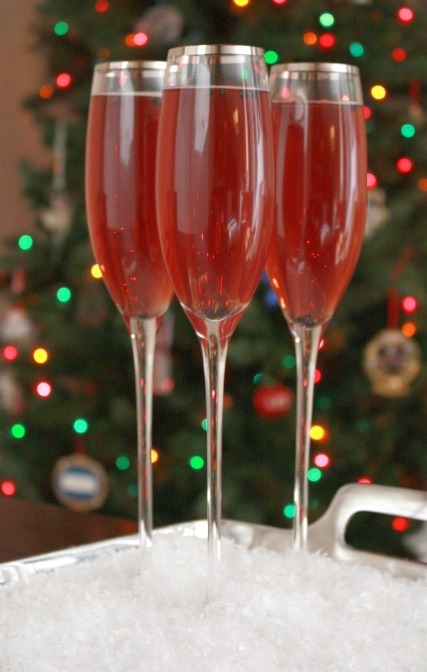 Cranberry lime bellinis: A refreshing champagne holiday drink that’s perfect for trimming the tree or passing around on a pretty platter at New Years. The Christmas season is certainly my most favorite time of year and this year it got a little brighter when Annie invited me to her Virtual Holiday Party! As a blogger, I’ve made some wonderful connections to other bloggers and this party is made up of some of best on my list. I have known a few of them for about 4 years…even before we started blogging! Our relationships started on a message board, moved to our blogs and blogging groups, to email and to our personal Facebook accounts. And these ladies have been my cooking, baking, and blogging inspiration for years. Wanna know who I hung out with at our Virtual Holiday Party?? What a list, huh? Well, you know as well as I do that if a party involves food bloggers, there’s going to be food. And this party was no different. Annie asked us to bring either a cocktail, appetizer, or dessert – the perfect kind of party food to pick on with good friends! Booze isn’t the normal thing you’d find on Smells Like Home. It’s what I feel like I struggle most with when I host people in my home so I figured this would be a great time to try out a new drink. Everyone needs a great holiday drink in their repertoire! So how about some cranberry lime bellinis? This cranberry lime bellinis recipe calls for prosecco but I think champagne worked just as nicely and I even made a virgin version (made with ginger ale) for those of us who pass on the booze. I knew the girls would love these! Pass around a tray of these in some fancy glasses with a few frozen cranberries floating in them and you’ve got not only a gorgeous holiday drink, but also a lovely drink to help to trim the tree! All that’s needed now (aside from some great chit-chat) is some more alcohol and of course some food! Kelsey didn’t let us down on the drink front. She brought along some Pepper Berry Cocktails – don’t they look amazingly refreshing?! It’s a good thing I wasn’t driving home from this party because these look just too good to pass up. 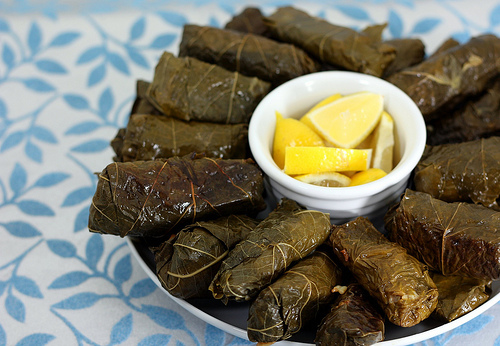 Elly is the queen of Greek food and she certainly brought it with these Dolmades (stuffed grape leaves). I’ve recently tried them for the first time and loved them but I’m sure the ones I had pale in comparison to Elly’s! 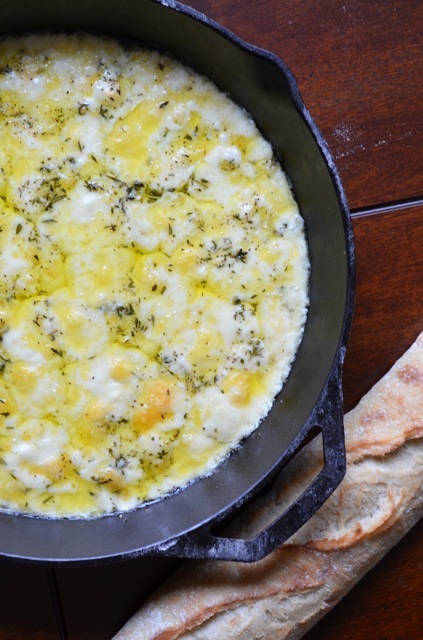 Nikki, be still my heart, showed up with Baked Fontina…a recipe I’ve been dying to try for weeks. Wouldn’t you just love to bury some toasty bread into this?! No holiday party is complete without dessert and boy were there two doozy desserts at this party! Josie graced our presence with Raspberry Cream Puffs. Uh…helloooo gorgeous! 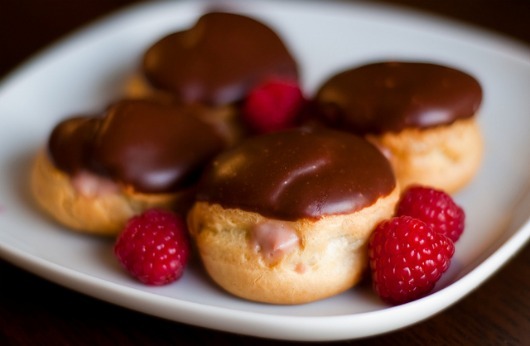 Just look at how that raspberry pastry cream is just itching to be tasted! And our hostess, Annie, made some of her most delectable treats: Macarons. She of course, upped the ante and made Candy Cane Macarons for this party though! Being a lover of peppermint myself, I absolutely can’t resist them! What a fab party this was – great friends and great food making this Christmas season just a little bit merrier. Thank you, Annie, for hosting and for inviting us to join you! I have a little surprise for you! Let’s call it a hostess gift, since I know how much you LOVE this treat. 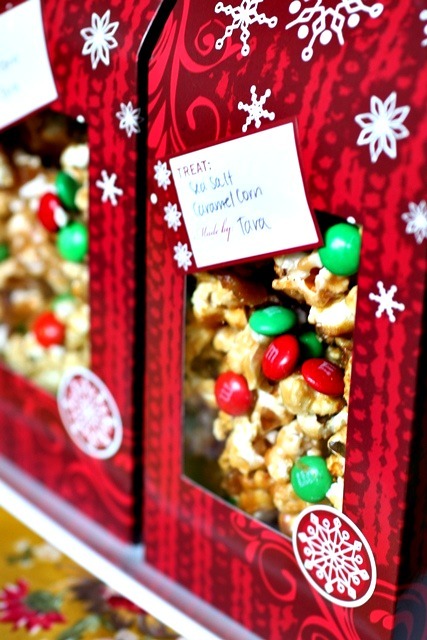 Sea salt caramel corn just for you! Merry Christmas everyone! Be sure to check out all of the links here for the fabulous recipes that go along with the amazing photos! P.S. – If you’re looking for more Christmas or wintery cocktails, let me point you in the direction of a few of my other favorites! The Mistletoe Kiss, with vodka, lemon juice, rosemary simple syrup, and seltzer is my absolute fave but the The Peppermint Mochatini (more of a desserty cocktail) and The Jack Frost (a delish tropical winter drink) are both close seconds! You basically can’t go wrong with any of them for a Christmas party! For the virgin version: Swap out the prosecco/champagne for 14 oz ginger ale and increase the amount of cranberry juice to 14 oz. In a large pitcher, pour in the cranberry juice, prosecco or champagne, and lime juice. Stir to combine. 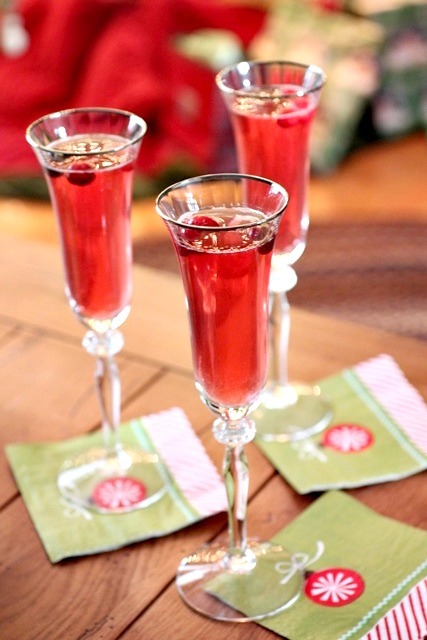 Pour into champagne flutes or tall slender glasses and garnish with a few frozen cranberries in each glass. Serve chilled. So glad we got to party together, Tara!! Love the idea of these bellinis. We’re doing breakfast burritos at my mom’s on Christmas morning, and I think these would go wonderfully with them! Great picture too – it seriously looks like its out of a magazine. What a beautiful post and a delicious drink, Tara! I had so much fun doing this virtual party and hope we’ll be able to do it again soon. Have a very merry and blessed Christmas. I really adore cranberry and lime together, and who can say no to a bellini? Thanks for participating in the virtual gtg. It was a lot of fun! These look like a great New-Years cocktail! Happy Holidays! Love your write up for our party! Your drink looks fantastic and I definitely think your idea for a hostess gift was great! Can I be invited next year?! All the different dishes and drinks look fabulous.. and that caramel corn? I love it. I really like the flavors involved in your cocktail.. I might have to go get the ingredients tonight! What a fabulous party menu! And I love those bellinis. I love any bellinis actually, but that flavor combination is just inspired. I’m embarrassed to say I wasn’t that familiar with the ladies on the guest list other than Annie, but at least I’ve now got a list of folks to go check out! These bellinis are beautiful! And your photos of them are exquisite. Wow, what beautiful photos of your holiday cocktails and goodies! 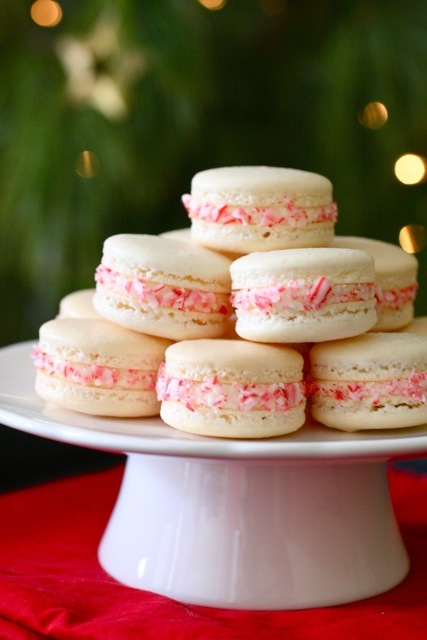 And those peppermint macaroons look amazing… What a fun party menu! wow!! the photos are so amazing..the wine glasses are soo nice i hope you share more stuff like this. I made your bellinis for Christmas breakfast and my daughter-in-law especially loved it. Actually, we all did, but she really LOVED it. I got new red crystal champagne glasses just for the occasion.